In 2008 Ford sold Jaguar to Tata Motors, Indian mega corporation that vowed to produce world cheapest car later called Tata Nano, which they did. So, how the producer of $1,500 car can manage British aristocratic and luxury brand? By the obvious results, quite well, as Jag is doing better and better as time goes. In 2007 Jag brake off with tradition in the executive segment as new XF replaced S type, having little in common with usual British design cues. Happily, it had little to do with enormously cramped and visually outdated interiors also. With 2012 XF they decided to play on the European market properly, and it came in estate version also. The second generation has been available from 2015, and no wagon was in sight, while chief designer Ian Callum dared to say that there even won’t be one. 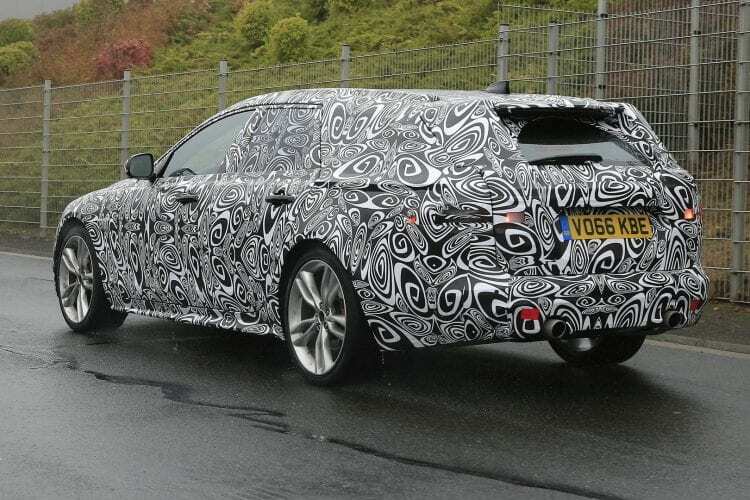 Well, that will turn out as untrue since spy photos of camouflaged multi-practic XF have emerged, showing future 2018 Jaguar XF Sportbrake. It is clear that wagon is going to keep unchanged front fascia from sedan version, and photos confirm that. Since spied test mule doesn’t have vertical slats inside air intakes, we can assume that spied vehicle is obviously top S model. Due to the heavy camouflage, it’s hard to say anything about important changes and that would be the ones at the rear. We should expect taillights from sedan to place themselves here too, maybe with slight alterations or none at all. What we can see is that roof line is quite alluring owed to the sloping line, openly coquetting with shooting brake shape which will make this wagon probably most handsome between the bunch. Cabin stays the same visually, and there is no doubt about that, but the emphasis, in this case, is on new figures, mostly concerning rear part of the car. We should probably expect 600 liters worth of luggage space and up to 1,700 liters when back seats are folded. This beats BMW 5 Series 560 liters or Audi A6 that offers 565 liters, while not enough for always tremendously spacious Merc E-Class with incredible 670 liters. Nobody thought that Jag would shoot for Merc figures, which are traditionally highest, and sloping roof proves that, but nevertheless it beats other parts of the premium trio with more space and still hotter body. We should anticipate the same lineup as with sedan, and that translates to 2.0-liter turbo petrol delivering 238 horsepower and 251 pound-feet of torque able to hit 60 mph in 7 seconds, as a base offer. There are more powerful petrol versions, and one of them is supercharged 3.0-liter V6 boosting 335 hp and 332 lb-ft, with an acceleration time of 5.4 seconds or even more powerful options reaching 60 mph in 5.3 seconds, due to the 376 horses produced by the same engine. Diesel offer is equally rich with base 2.0-liter rated at 161 hp and 280 lb-ft taking quite long 8.7 seconds to 60 mph, so better choice would be 177 horses and 317 pound-feet of torque version, lowering needed acceleration time to 8.1 seconds. For the end, top 3.0-liter V6 turbodiesel offers quite decent 296 horses and remarkable 516 lb-ft of torque punch, hitting 60 mph in 6.2 seconds. All mentioned engines could be paired with a 6-speed manual or 8-speed automatic, while AWD exists as an option. Why not? The German view of executive estate wagons is quite boring when viewed from the back and since new Volvo V90 joined the game with an intriguing rear end, why would Jag miss its opportunity with gorgeous and dynamic roof line. 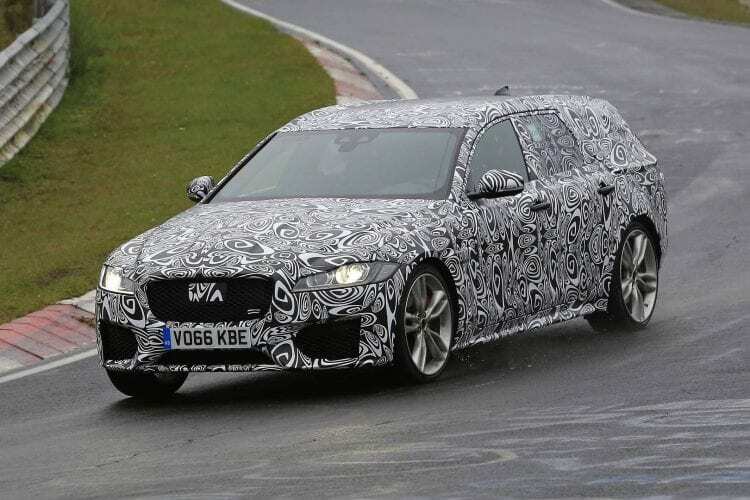 So, if you can’t wait and you are for handsome estate go for Volvo, but if you also prefer to corner with it, be a little bit more patient just as 2018 Jaguar XF Sportbrake is about to hit the streets.